Alex is a senior member of our creative department. He brings ideas and conceptual thinking to the fabl table. 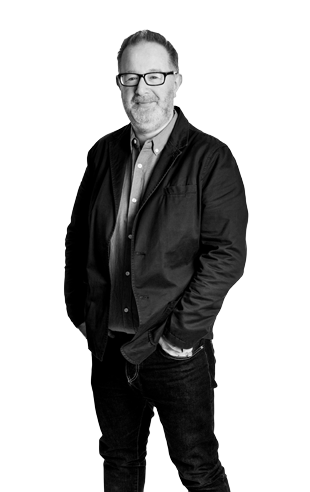 He joined in the Autumn of 2015 having worked for the last twenty years as a copywriter in some of London’s biggest agencies including Ogilvy, JWT, M&C Saatchi, D’arcy and Young & Rubicam. During that time Alex worked on accounts ranging from BP Fuels to Nurofen via Pal Dog Food. Alex thrives on diversity and is equally at home creating content for The South African Diamond Corporation as he is creating and writing children’s cartoons. His experience spans fashion, lifestyle and retail – having written copy for among others, New Look, Virgin Megastores, EMAP and HR Owen. He was also former joint creative director of his own agency, Superhero where he launched Zoo Weekly Magazine and co-directed the brand’s TV commercials. Alex has vast experience in TV, print and social media, but he particularly enjoys the challenge of writing and creating radio ads where he won Aerial Awards for the COI. Having returned to the north, Alex loves being part of a smaller team at the fabl – working across accounts such as Intercontinental Brands, Karcher, Wren, Wellocks and Toolally Jewellery. Alex is a fellow of the Royal Society of Arts and is only three feet tall.